Nikolaj Busk Jakobsen in action against Scunthorpe. Team boss Carl Johnson has urged Panthers fans not to expect monster scorelines on a regular basis. The city racers destroyed Scunthorpe 64-26 in their opening home meeting of the season last Friday night. But Johnson was quick to insist considerably tougher challenges will lie ahead than that posed by the Scorpions during the Premier League Cup Midland Group drubbing. 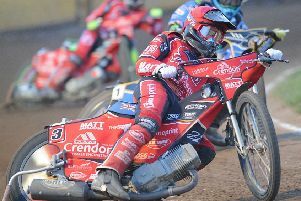 And he is bracing himself for the first of those tomorrow (Friday) when Sheffield visit the East of England Showground in the same competition (7.30pm). “We could hardly have started our home fixtures more impressively,” said Johnson. “The boys were on it from the word go and we showed everyone what we’re capable of producing when we’re all on song. “It will have been great for confidence, but we have to realise there are much tougher tests ahead. “Everything went right for us and a lot of things went wrong for Scunthorpe. “What happened last Friday won’t happen every week. In fact it was probably a one-off. Sheffield will push us a lot harder as they have riders who can perform just as well at our track as we did up there last week. Panthers then hit the road to Scunthorpe on Sunday (6.30pm) with Johnson warning against complacency following the demolition job in the reverse fixture last Friday night. The Scorpions have failed to win either of their home meetings to date - being held to a 45-45 draw by Ipswich before slipping up 50-43 at the hands of Sheffield. Johnson added: “Scunthorpe will want revenge at their place and will be out to prove a point. “They’ll want to rack up a big score, but they’ll be under pressure due to not yet winning at home. Panthers, Sheffield and Scunthorpe are currently locked together in the Midland Group standings on five points. Johnson’s men top the standings thanks to a superior points difference. Panthers and Sheffield have only ridden twice compared to Scunthorpe’s four meetings while Ipswich currently bring up the rear with two points from their two meetings to date. Sheffield are scheduled to entertain Scunthorpe tonight (Thursday) as the race for the one place in the semi-finals hots up.